What do you think made this wound? (Latest Updates). 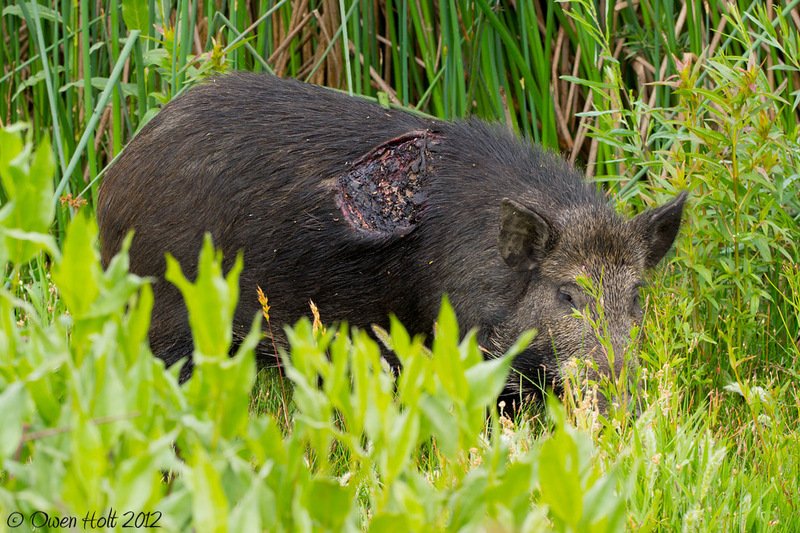 I'm leaning toward Mtn Lion, maybe a young one that found this pig a bit to hard to take down. So what do you think? It looks like the skin got ripped back, more than I would think a barbed wire fence could do. Lightning? NorPac bite? Meteorite? Flamethrower? Repulsor Ray? Re: What do you think made this wound? No idea what caused that wound but I wouldn't want to piss it off. My first thought was also another pig. Repulsor Ray was second. I didn't think it was another pig because this was a smallish year old one (around 100lbs or so). I can see the big ones getting into each other, but hard to picture a big 'tusky' one going after a smaller one. That's a tough one...a pig is very "hard", not loose skinned, so it is tough to imagine how it was so deeply cut...or maybe at Gerry inferred, it was cut more shallow and infection or necrosis caused the gaping wound? Honestly, it looks like a shark bite from the flanks of a tuna. Barring other evidence, I will go with your lion theory, as it would take something powerful to penetrate the tough hide and tear it backward...were other wound visible? I have seen pigs damage others, the wounds are not so gaping, usually more narrow slashes, and usually lower on the shoulders, boars have very thick skin there, adaption to fighing I would guess? BTW, you shot some great coyote photos, in the last two weeks I have been seeing 6 -8 week old coyote pups about, maybe a good photo op for your family group? Yikes, maybe it's flesh-eating bacteria! Interesting wound. I would rule out other animals, just because the wound seems to much of a "clean" injury. I would expect a predator-inflicted wound to be more torn/slashed etc. What is going on with the skin though? it almost looks like the outside of a grilled steak with that almost charred look. I'm going with rotting rather than torn. Maybe rattlesnake bite (necrosis?) but a little high for that. Best guess would be either human-inflicted in some way (don't know how) or infection. i think that pig meet wild animal that's how the pig got the wound.. It's hard to believe that's the same animal. Any chance it was a burn wound? Any brush fires or anything in the area? Maybe it was clipped by a car? Maybe alien obduction? Same pig. Same little nick on the top edge of the right ear. Also, this pig is now solitary and feels OK around people. Most of them run away. I think it's one of these from a group of five youngsters last year (40-50lbs then). They would follow my 65lb dog and had no adult 'mentor' to teach them to fear folks. The last time that I photographed it, I had to wave it off after it came within 10 feet of me and the dog. Huh, it certainly looks to me as if there's evidence of a vertical slash in your latest picture. Now looking back at your first picture I think maybe I can see it there, too, and maybe also a similar slash nearby and more or less parallel to it. Hard to tell for sure; the human mind is so good at discerning patterns that it often does so where none actually exist. Be careful for yourself and your dog out there, Owen. 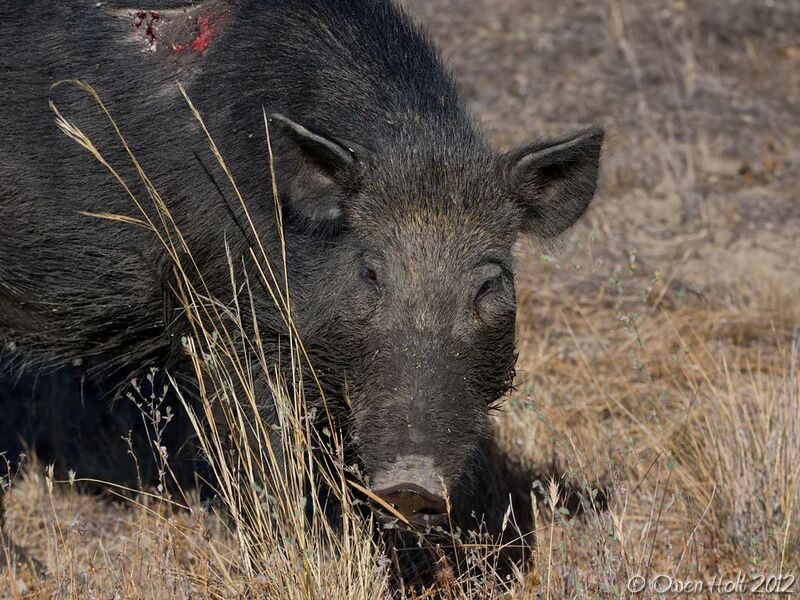 Feral pigs are potentially dangerous under normal circumstances, and I would imagine the danger is greater around such a fearless one. Re: What do you think made this wound? Updated to current. Well, looks like wounded pig now has eight little piglets. She's still at ease with me and the dog and is grazing obsessed. As cute as these babies are, they're going to be big rototillers next spring. Right now, they're potential bobcat food. Re: What do you think made this wound? (Latest Updates). that is an amazing photo series, you were truly in the right place at the right time. 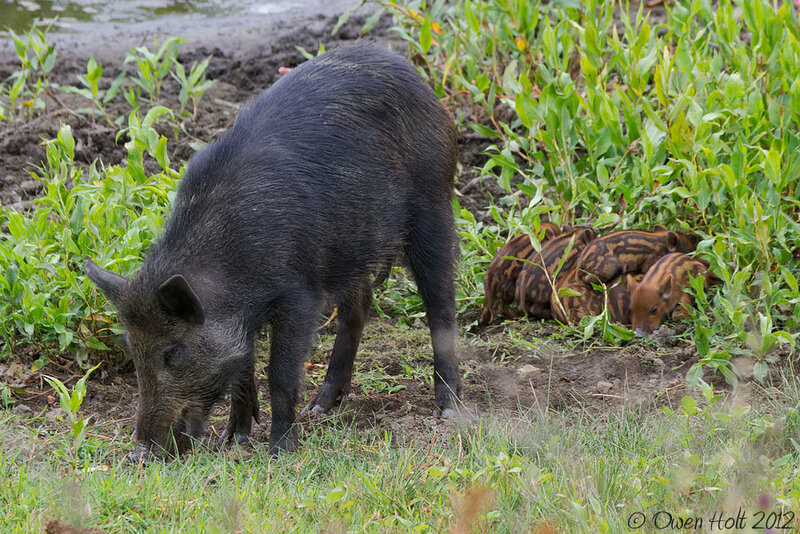 The feral pigs I know, even in parks, are usually wary, and I am amazed you shot these impressive photos. I think your Hawaiian heritage is expressing itself...are you getting attached to these pigs? 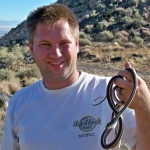 I have been conditioned to really dislike them, in terms of range management, they are bad news as I am sure you know. I have seen meadows turned into muddy quagmires overnight...with nary a bulb, rhizome, fungi, grub, herp, or virtually anything organic remaining, and invasive opportunistic weeds to follow. Is this herd you are seeing regularly doing much damage to the range? To the herp population? Are they rarely if ever hunted and tolerant of photographers or are you stealthy and utilizing a blind? If you want to feature a feral pig at a luau, give me a call, we might work something out. Great job giving us the "rest of the story", I had been wondering whatever happened to that sow, and the wound seems to be healing remarkably well. I had a friend catch a feral piglet and raise it up. It did fine, but gained weight/growth at a substanitally lower rate than another farm bred piglet of approximately the same age, it appears genetics/breeding may make a difference in efficiency. 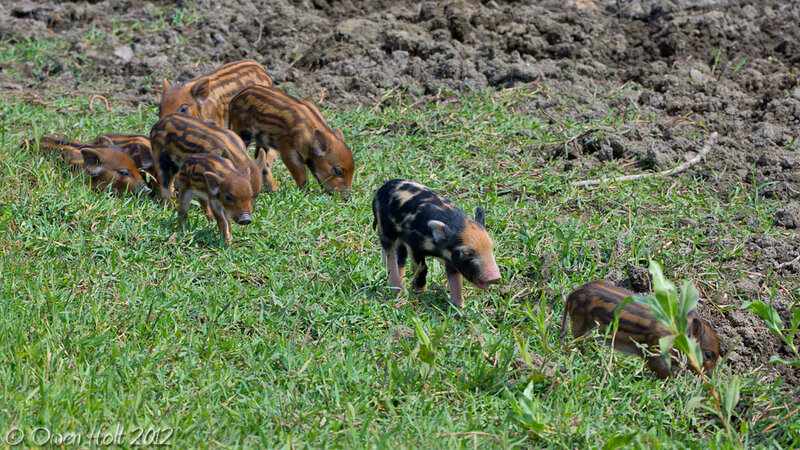 I agree, week old piglets are really cute. Great post of interesting and rarely seen photos. Yes, the pigs do a heck of a lot of damage. That group of five from last fall are the only pigs that 'grew up' around people, so they never had any fear or aggression. I'm sure this sow is one of the five. I'm surprised that the year old is having babies, but since cats and dogs can do that, I guess pigs can too. As it relates to herps, they till up the grassy basking spots where the garters hang out to the point where it's just lumpy dirt. The rodent holes there are gone as well. I'm not sure how many get 'consumed' in the process, but I doubt many end up on the menu. 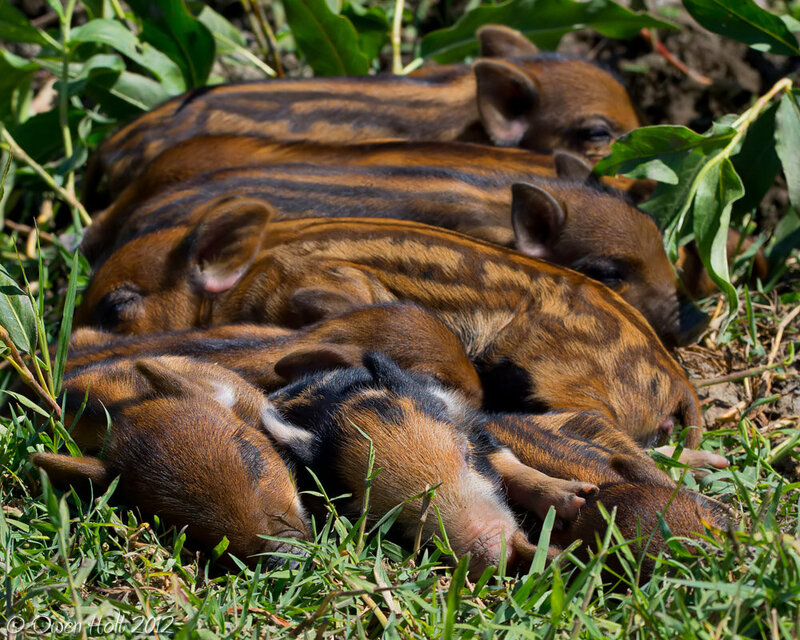 No luau for the piglets. They're the size of your average black bass (12"-15"). I just pick a spot to photograph from and the pig works it's way toward me. Babies follow and then they pile. I do everything simple. No blinds, tripods, etc... 99% handheld. 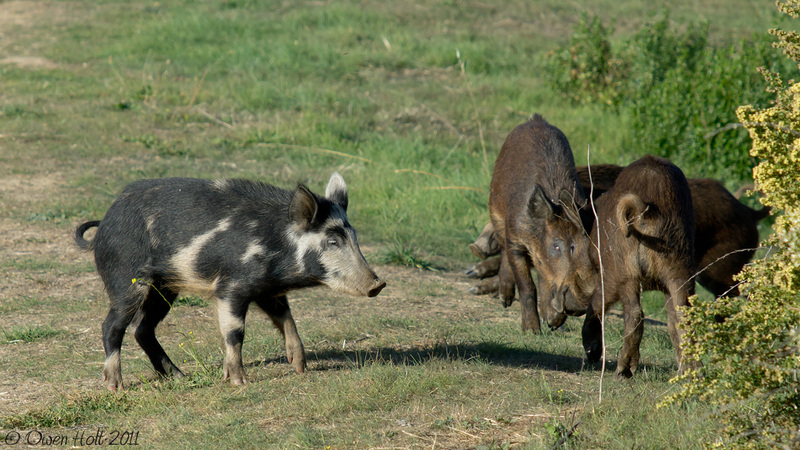 These pigs are domestic feral/euro boar mixes and that's why the occasional 'african wild dog' pattern comes out. 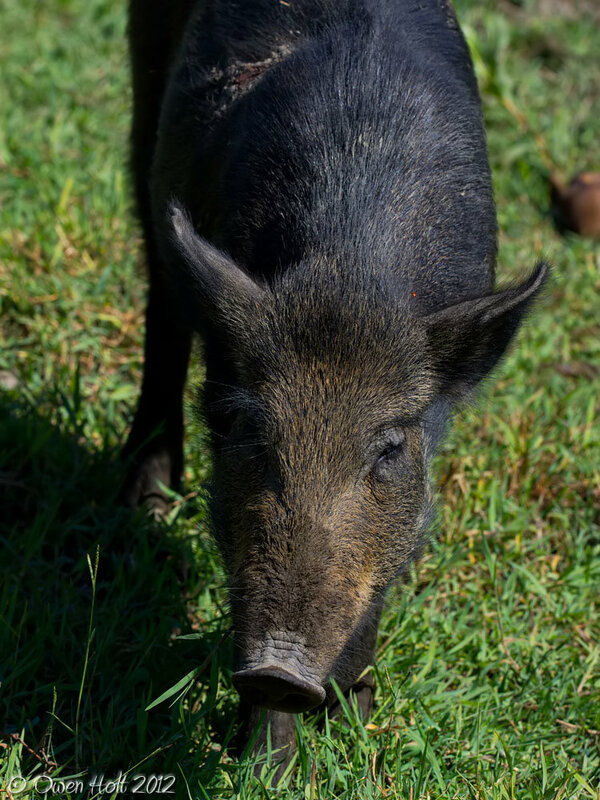 I have never seen a feral pig! I know they're around. I just wish I get to see one soon. The only way they are worth seeing in this country is through a gun scope. Andy Avram wrote: The only way they are worth seeing in this country is through a gun scope. 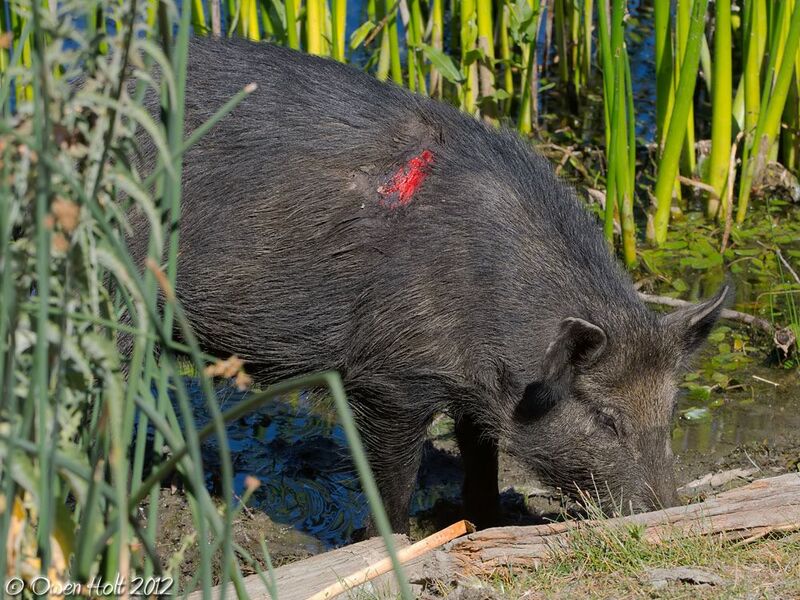 Looked like 'road rash' to me... perhaps the sow got caught under the bumper of a car, and took damage on her shoulder? Didn't look at Owen's avatar. 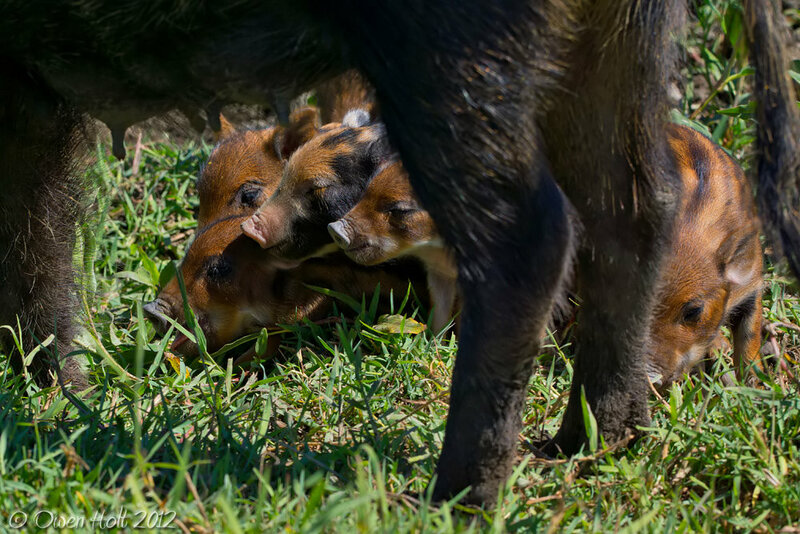 I was commenting more on how serious an ecological problem wild pigs are in this country, and a problem that is growing by leaps and bounds. Their spread needs to be stopped as quickly and efficiently as possible. 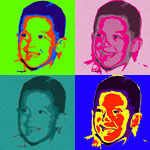 Andy Avram wrote: Didn't look at Owen's avatar. 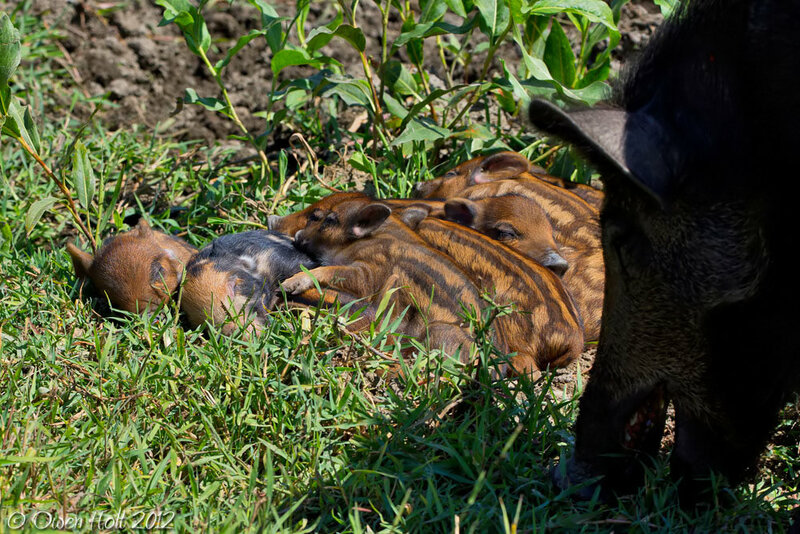 I was commenting more on how serious an ecological problem wild pigs are in this country, and a problem that is growing by leaps and bounds. Their spread needs to be stopped as quickly and efficiently as possible. I know pigs are bad, and I hate the ecological damage they do to herp habitats. 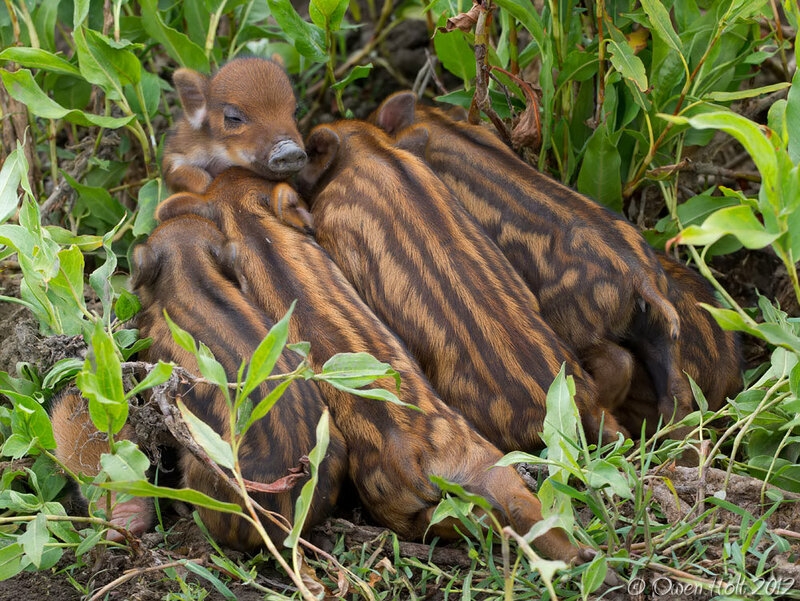 Still, those piglets are downright adorable. 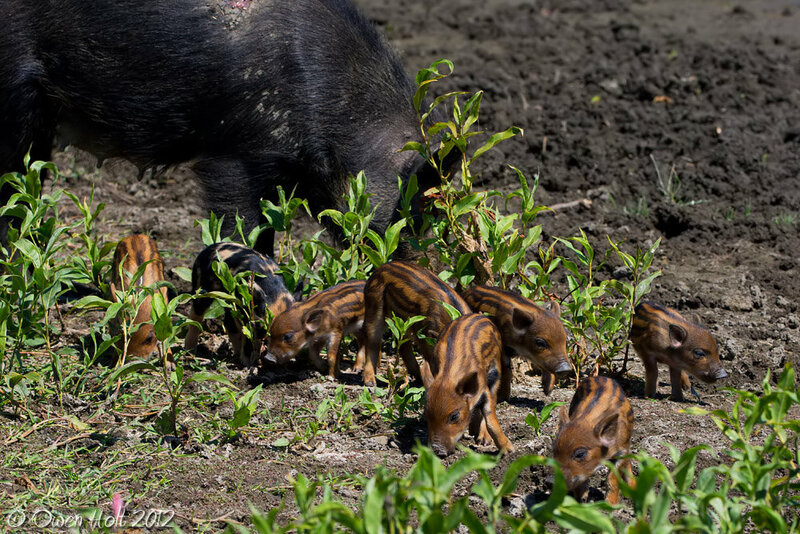 Feral piglets are cute but look better in the freezer. They do tremendous damage once they exit the cute phase. Bites and other puncture wounds can readily abscess, there are hard caseated self limiting ones or active producing pus boluses and when the soft ones continue to prosper the stretched and weakened skin finally breaks, with minimal or even no contact. An open plane of underlying flesh - like what is seen on the pig (and also humans in impoverished situations ) is exposed that is cleaned up and debrided by myiasis. The site of the wound is significant to a successful resolution to secondary sepsis, either by the animals own self licking and grooming behaviors, or in this case, the sun. The process of healing especially in unattended wounds can present confounding patterns. Busted abscesses can look especially bizarre. A general rule of thumb is things commence quickly, even active myiasis is a startlingly sudden and can end just as quickly. A sore with no more dead tissue is like a one night stand, or maybe just a couple days on the green. The worse picture of the pig is actually not as bad as it looks. I have every confidence that she was careful how she slept, and how she foraged to favor it. And I bet she sunned herself instinctively, and deliberately. One can do both. I see alot of speculations about wounds as to cause but it is always good to include the fact that they change as they resolve, sometimes dramatically from the original state. They can get bigger before they get smaller with new tissue. The dogs in my neighborhood gets wounds that look EXACTLY like that all the time. As in I must see them on at least a monthly basis, if not more than that. Often in that same spot. With the dogs I've usually thought the wounds probably came in fights with other dogs, though I'm open to other possibilities because I've never actually seen it happen. The possibility of cars/motorcycles somehow being involved is a strong possibility too because they're always sleeping on roads. 1) Big piece of skin gets ripped off somehow. Wound is open and fresh. 2) Wound begins to infect and looks gross. 3) Wound begins to fill with maggots and look really, really gross. The first few times I thought for sure that the dog was a goner. 4) Wound begins to heal. 5) Dog left with a big scar. The degree of absolutely disgusting wounds that I've seen malnourished street dogs with absolutely no care, sleeping in dirty, disgusting conditions, still manage to heal from continues to astound me. Pig skin is very dissimilar to the skin of dogs. Pigs have skin that is closer to human skin in important ways, so similar that it has been used in human medicine to study wound processes, including myiasis. I wasnt trying to argue or be a know it all, but i am perhaps inordinately interested in not what caused the wound, but the odyssey of wound resolution especially when myiasis is involved. Its is amazing that the gory open plane seen, could have started as a much smaller bite, and that the abscess itself is a multi species world unto itself of bacterial dynamics, once it explodes or opens as pig and unattended human abscesses do especially on certain body sites, the ecology that follows is incredible. Thats what was so interesting to me, and its so different from pigs in agriculture where bite wounds and abscesses are common and never resolve without drug and mechanical intervention, and the myiasis a non helpful type in those circumstances.